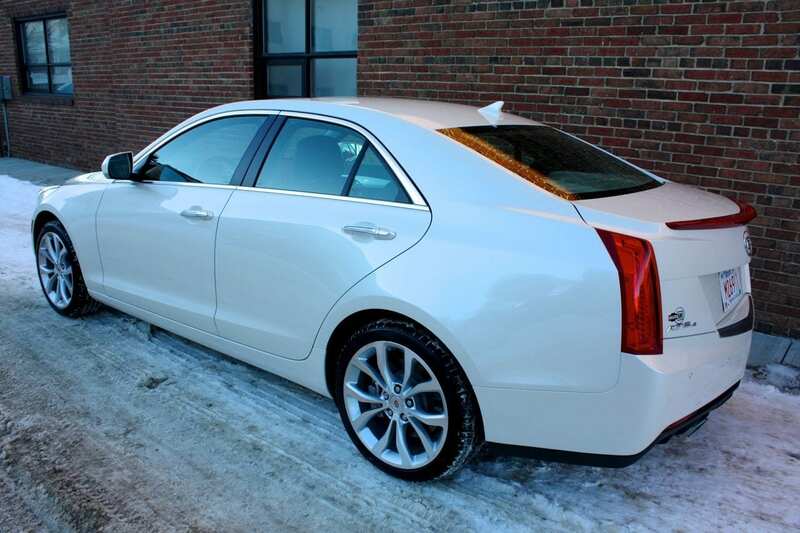 A Cadillac that claims it’s “built to be the world’s best sport sedan”. A few short years ago, that would have been laughable by any standard. Frankly, there are plenty who consider it a joke today. But GM has come a long way, and they certainly weren’t fooling around when they developed the ATS. As a matter of fact, they had a very specific target in their sights. 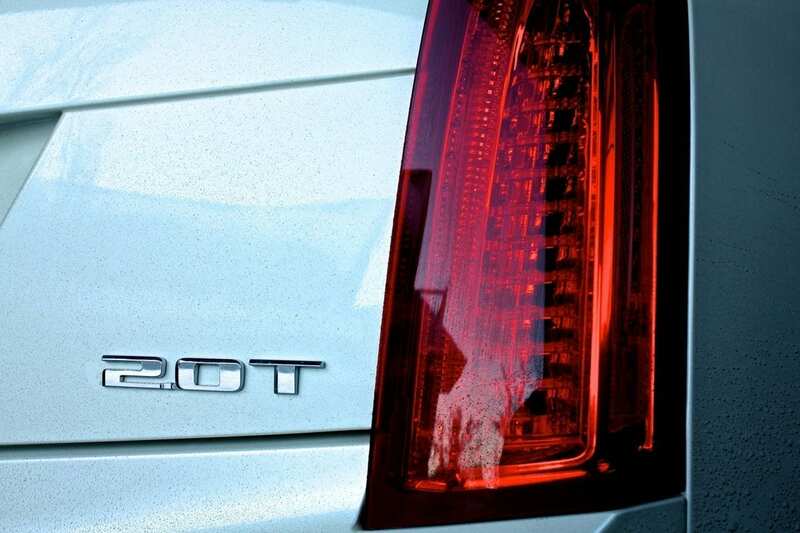 They’ve made no bones about the fact that they were aiming squarely for the BMW 3-series. They even say so in some of their marketing. In my opinion, that was silly and made them come across as desperate. I’d rather have seen them introduce the ATS on its own merit and let the product do the talking. I had the chance to test drive the ATS in late 2012. It was an hour behind the wheel of the hot-rod version – the 3.6L rear-wheel drive one. That one was spectacular. But I live in Edmonton, the land of two seasons – winter and potholes. And I commute. And I have a family. 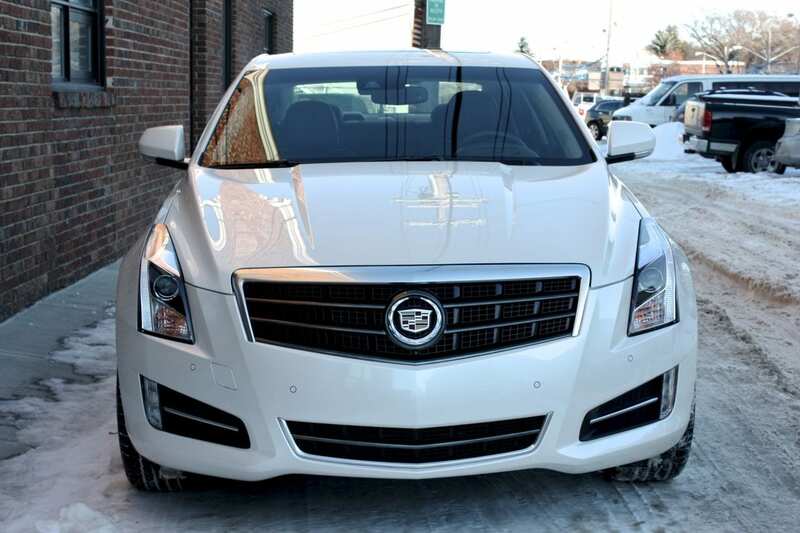 So this is the ATS I’d be shopping for. The one with the 2.0 Liter turbocharged 4-cylinder driving all four wheels. 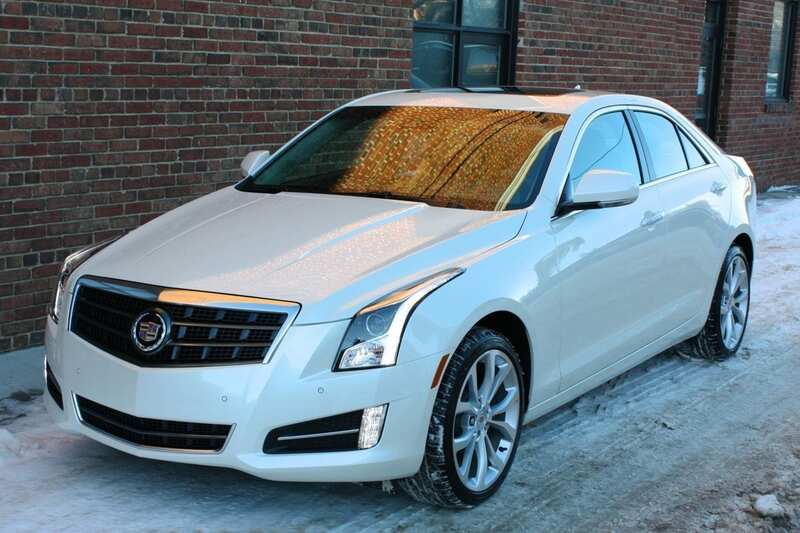 The base price of this ATS trim is $50,950 – equipped with the sunroof and the White Diamond Tricoat like mine was, it comes in at $55,335, everything in. It seems as though everyone has a 2.0 Liter turbo 4 these days. But check out the numbers on this one. 272 horsepower at 5500 RPM. And 260 lb.ft of torque at a low 1700 RPM. That’s some serious power-density for that displacement. Especially for a car that doesn’t get too heavy – with the automatic and the all-wheel drive system, it weighs in at 3543 pounds. It all makes its way through a relatively blasé 6-speed automatic, and out to all four corners via an all-wheel drive system. Fuel economy is good but not great. 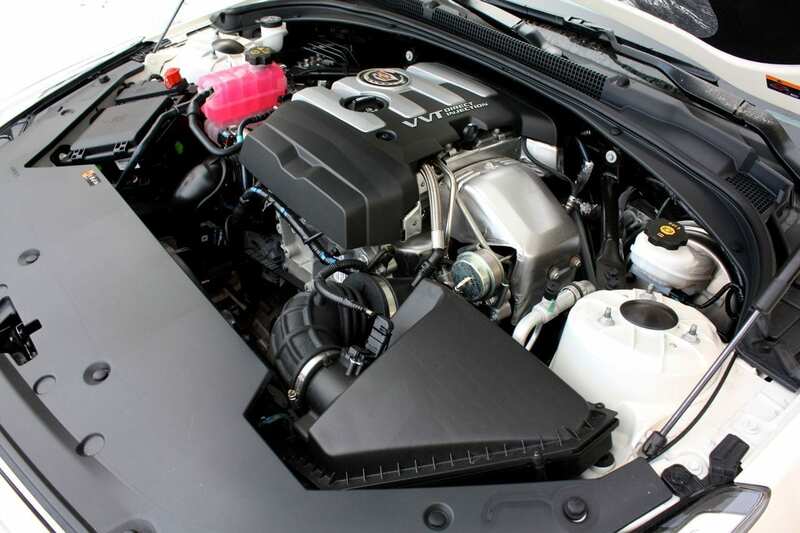 The ATS (in this configuration) is rated at 10.3 L/100 km (23 mpg) in the city, and 6.6 L/100 km (36 mpg) on the highway. The fuel tank holds 61 Liters of dino-juice. I tried two different ways of driving this car. For a while, I drove it hard. Fast. The opposite of economical. And it returned a very reasonable 13.2 L/100 km (18 mpg) during that time. For the balance of the time, I drove it as I normally would – commuting, getting groceries, occasional freeway drives, making no effort to save fuel – and I netted a surprising 10.1 L/100 km (23 mpg). That’s really good for a 270 horsepower sports sedan. And better than the rating. I can probably count on one hand the number of times I’ve been able to achieve that. Cadillac stuck to their guns with the exterior styling. 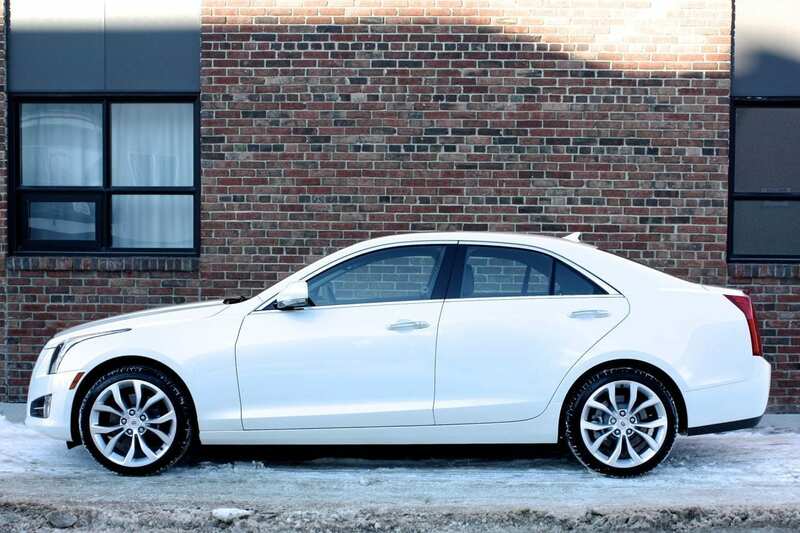 Although it’s instantly recognizable as a Cadillac, the ATS has a nice aggressive stance, with clean lines and some pretty eye-catching details. 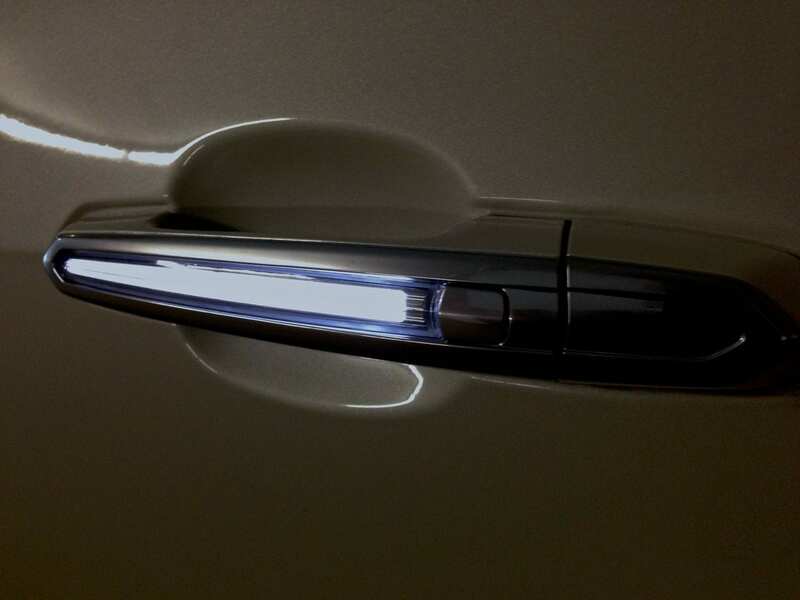 I (and virtually all those who came to check it out) loved the long, vertical strip of super-bright LED driving lights that cascade down from the edge of the hood through the headlight cluster. The creases around the car aren’t folded too sharply and the proportions are kept very tidy. Personally, I think this is the best-looking Cadillac in a long time. I liked the 18” rims on my review car, shod with 225-sized rubber. 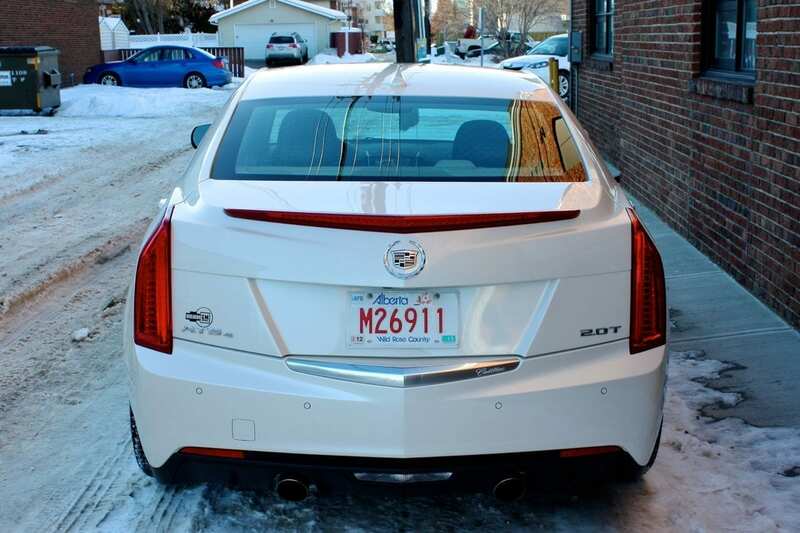 The overhangs are short, almost shockingly so in the front, and Cadillac’s dual exhaust tips (edging toward the center) look like they mean business. I was actually surprised at how many looks this car got. Lots of looks. Lots of thumbs-ups. 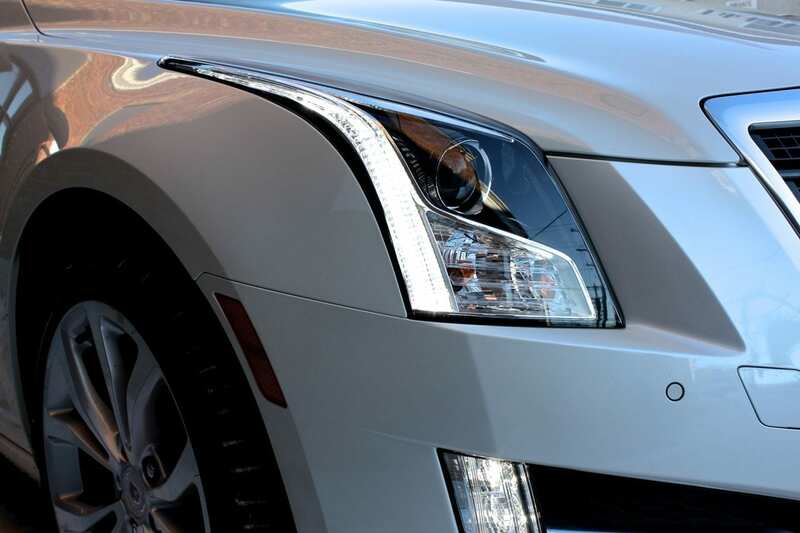 The ATS will surprise some with its firm, sporty ride. Having recently reviewed a BMW 3-series, I almost felt as though the ATS has traded places with it. Where the BMW felt somewhat softer than I expected, the ATS was surprisingly firm. This is my kind of suspension – what I look for and want in a sports sedan. When you compromise a bit on the ride, you get a very athletic feeling car. The ATS is very poised, and invites you to play around corners. When you do, you realize you’ve been paired with a very competent partner. That can dance. I enjoyed the incredible balance that the ATS exhibited in every situation I threw at it. The steering was flawless for this class of car. It’s heavy enough at every speed, and weighted to give a perfectly connected feeling. There is always good steering feel and turn-in was quick and very direct. I found the turbo engine to be tremendous. Is it the most powerful thing out there? Nope. But it suits this car. It feels strong after you overcome the very short lag and it builds momentum with alacrity. Of course it’s great for everyday driving but when you get on it, the mid and higher range power is awesome. 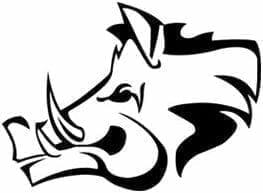 When it’s on boost, and you stay on the go pedal, it pulls like a freight train, and it seems as though it pulls as hard in second gear as it does in first. The six-speed automatic transmission is where this car fell a bit flat for me. It’s very smooth and luxurious, and never left me wanting for more in that department. But I couldn’t find a real sport mode where it holds the shift points longer and is more aggressive. Unless I missed something, I couldn’t get the programming to be sporty enough when I wanted to drive hard. 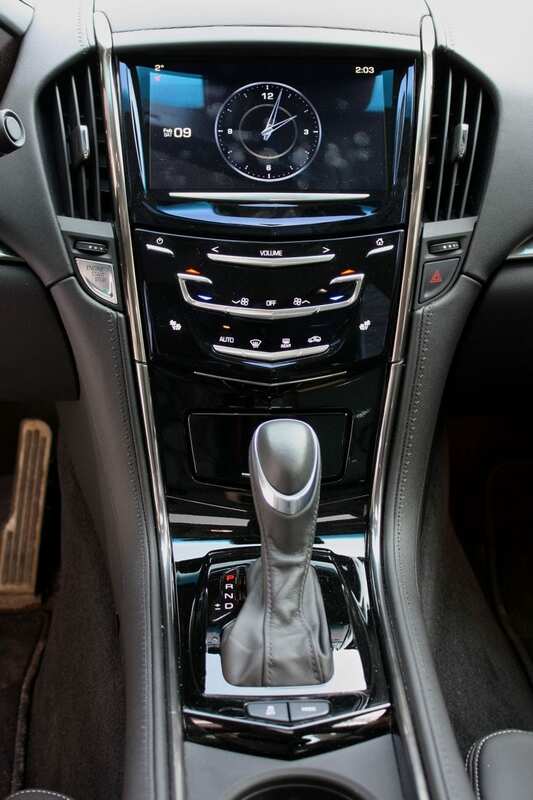 You can shift it manually using paddles or the gear selector. I found it to be pretty fast in manual mode. The 4-cylinder sounds great inside when you’re on the gas, as the turbo spools up nicely and it has a sporty snarl. Unfortunately, it doesn’t sound nearly as good outside – it’s too quiet. The 3.6 Liter V6 ATS on the other hand sounds lovely inside AND outside. All noise levels are very well controlled – nothing ever gets loud or intrusive. I found the brakes to be excellent – very easy to modulate, powerful when you need them. The visibility is very good – all sight lines are great, but the rear view is slightly constricted vertically – with that said, you can see everything you need to. The all-wheel drive system is very good. It is perfect for everyday driving – it’s transparent when you don’t need it, and when you need traction, it’s there. Turn the traction control off to play in the snow and you can happily steer with the rear end all day long. I never caught it binding or getting in the way of itself during aggressive driving. I liked that the ATS invited me to play. All the time. It never seems to be shy going into a corner, sticking to it, and coming out of it. Materials are lovely. There is soft, stitched leather-textured material throughout, and although things are a bit dark, it certainly has a nice, premium feel to it. There are some glossy piano black panels, as well as a few aluminum trim strips. Fit and finish was as good as it gets, and the car felt very well put-together and rock-solid. The ATS is not a big car. My 5’10” frame never felt cramped, but anyone much taller would be running out of headroom. To me, the car felt tidy inside – not too big, not too small. Styling-wise, I really enjoyed the toned-down feel in the ATS. Cadillac can take things a bit far sometimes, and here I felt it was just right. There are some Cadillac elements, but nothing felt overboard. It is a handsome, relatively simple, straight-forward interior. And the lines stayed clean. 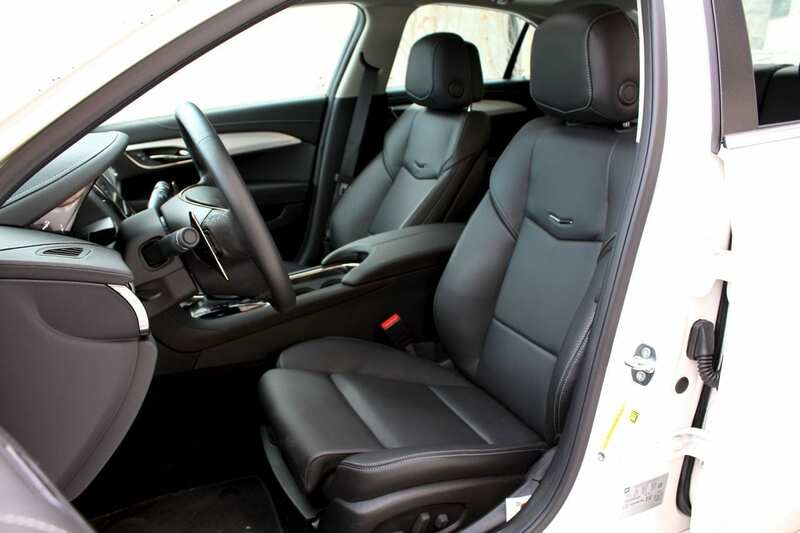 The beautiful leather seats – power-adjustable and heated, with driver’s side memory settings – are simply fantastic. Not what you expect to find in a Cadillac. They offer the perfect harmony of sport and comfort – with bolstering to spare. 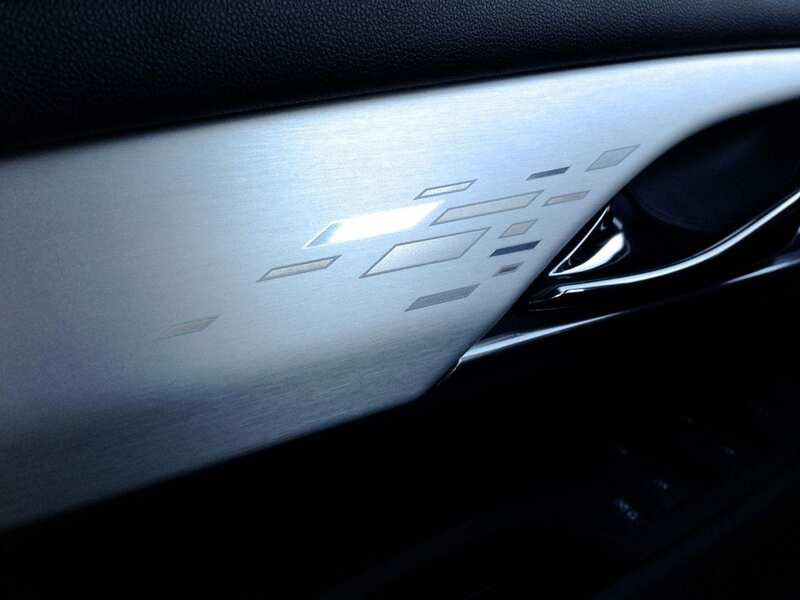 Their perforated panels and Cadillac V badging are also easy on the eyes. 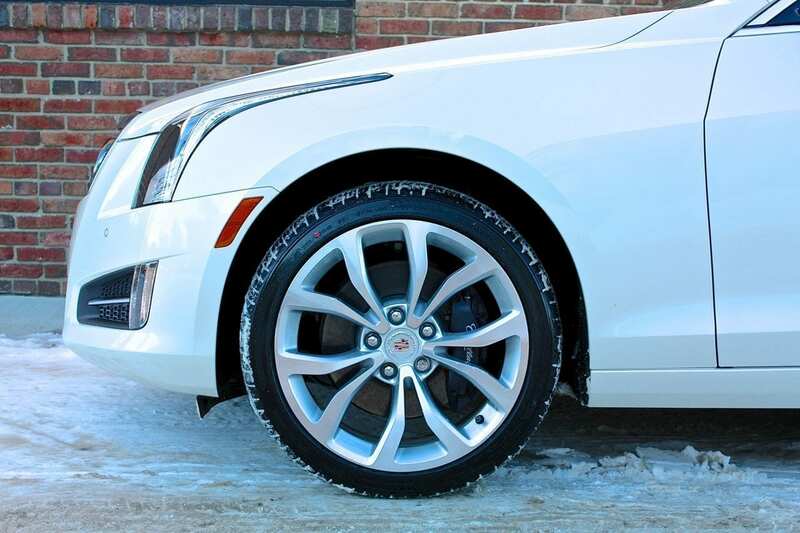 The heated steering wheel is great with a smaller diameter and perfect rim thickness. It houses buttons for cruise control, media, handsfree/phone and the driver information screen. Behind the wheel sits a bin of gauges as well as the driver information screen. This is an interesting bit of tech. There are three parts to this screen – the left, the center and the right. Each one can be programmed to display what you choose. The left and ride sides can show you a variety of driving-related goodies – digital speedo, fuel economy, range, tire pressure, trip meters, etc. 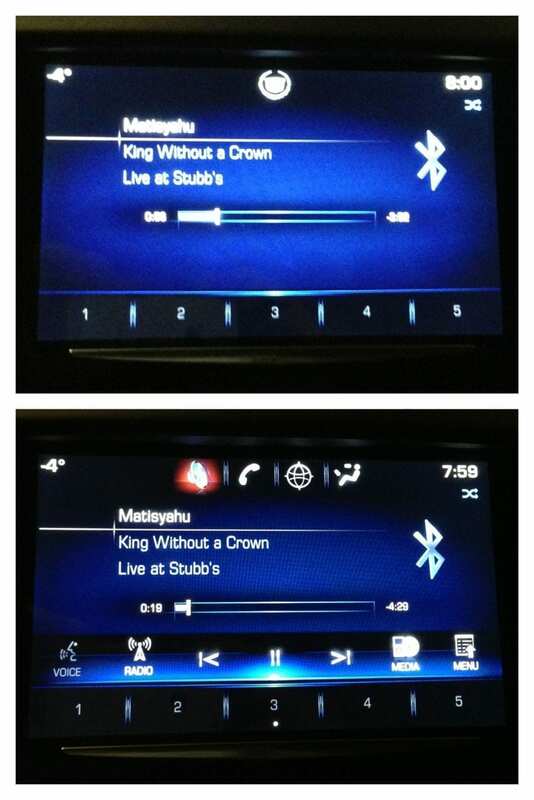 The center can show what’s playing on your sound system (including cover art! ), a compass, vehicle settings or your phone menu. 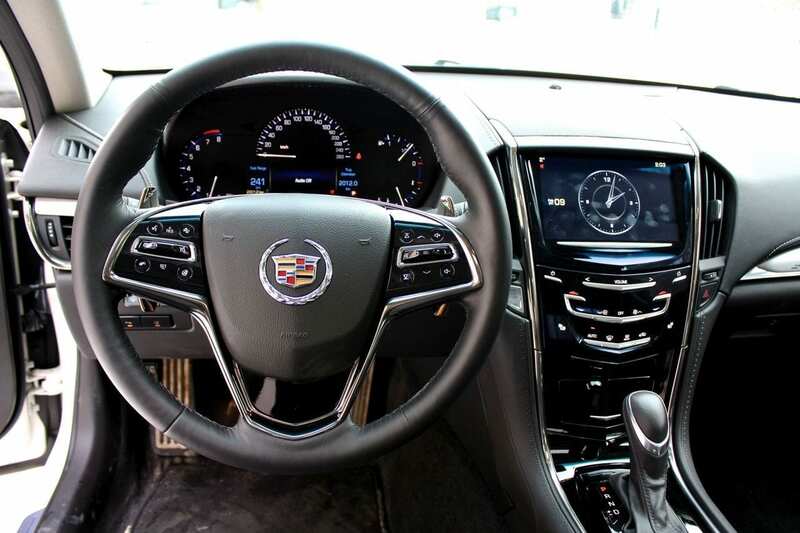 The center stack starts with Cadillac’s new CUE (Cadillac User Experience) system – it’s handled by an 8” touchscreen and manages the media, navigation, phone and vehicle settings. It’s a beautiful, responsive screen, although it quickly got fingerprinty. The user interface is a new way of doing things. There isn’t an input device – it only uses touch. I love how the screen displays the critical information about whatever you’ve chosen to be doing on it, and keeps things clean and simple. But move your hand toward the screen, and it instantly pops up screen-based buttons, contextually related to what you’re doing. For example, if your music is playing, it simply shows the artist and song title. Move your hand to the screen and before it gets there, you’ll see all the available menu options, as well as the play/pause button, track forward and back buttons, etc. The screen also handles the back-up camera, which adds moving trajectory lines – very helpful to see where your car is headed. Whilst parking, you also have a visual aid in your driver information screen ahead of you, showing you the front and rear of your vehicle and any spots where things are getting too close for comfort. Below the CUE screen you’ll find a simple, smooth panel with soft-touch buttons to control the dual-zone, automatic climate control system. The touch of any of these buttons or anything on the screen is rewarded with haptic feedback, assuring you the command was understood. The sound system is a 10-speaker BOSE. It feeds off AM, FM, satellite, CD, auxiliary, USB and streaming Bluetooth sources and it sounds spectacular. The console houses the gear selector, a couple of cupholders and an armrest. Entry is keyless, and the ignition is push-start. Overhead, you’ll find a tilt/slide sunroof, 3 position HomeLink garage door opener and GM’s ubiquitous OnStar system. In terms of driver tech, there is some cool kit here as well. 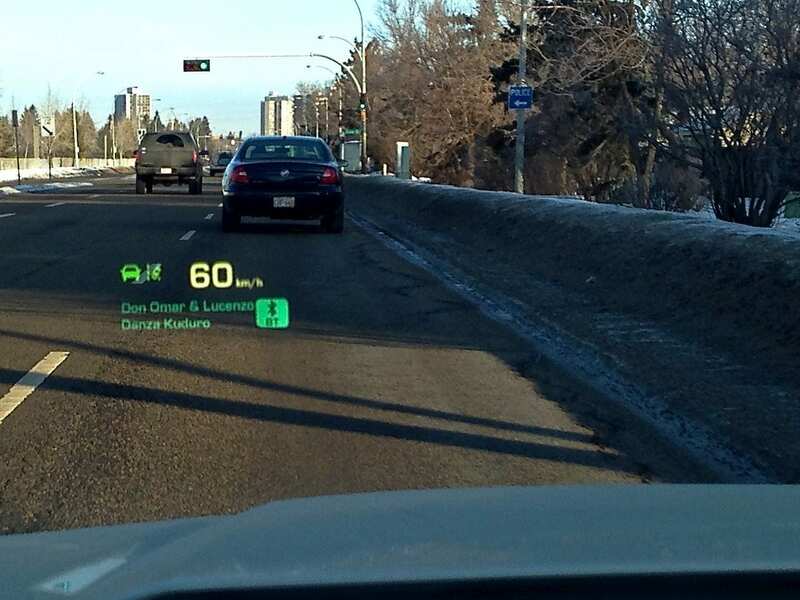 Let’s start with the HUD (Heads-Up Display). It’s beautiful, sharp and easy to read, and allows you to display either an electronic tach or speedometer, navigation information or a compass, or what’s playing on your sound system. It is also the visual forward collision warning display – it flashes red with the collision symbol to get your attention. There’s also a lane departure warning system. 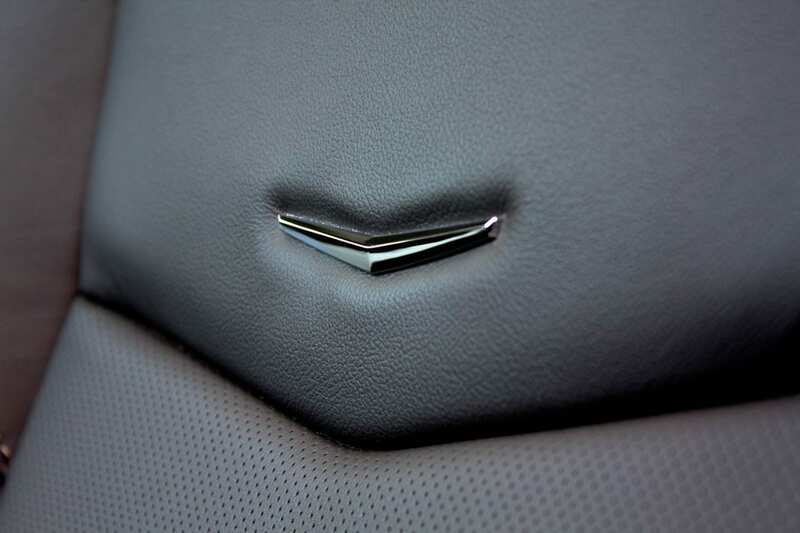 And in terms of getting your attention, Cadillac has another trick up its sleeve. They’ve got something called Safety Alert seat pulses, which sends noticeable but not jarring pulses through the thigh bolsters of the driver’s seat. For example, if you’re about to back into something, it’ll buzz you. Drifting out of your lane? You’re getting buzzed – on the appropriate side. It sounds bizarre, and it is at first, but I really liked this feature once I got used to it. 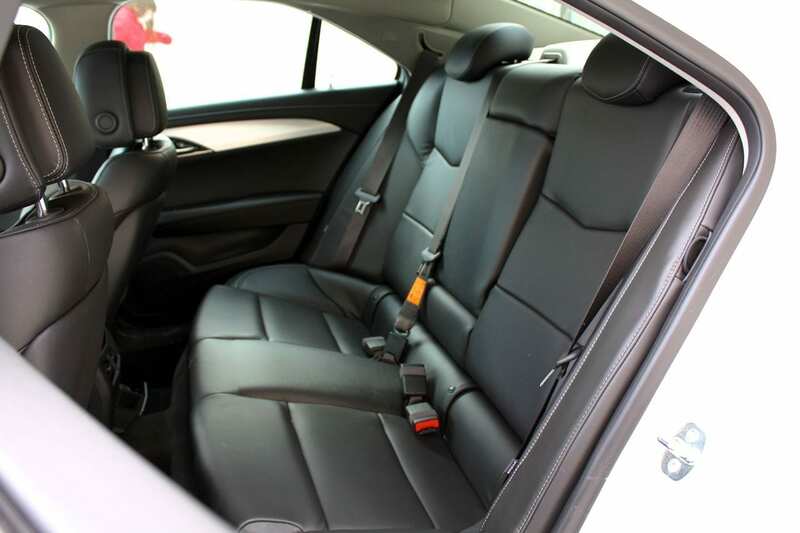 The rear seats are not the ATS’ strong suit. But that’s fine – the ATS never advertises that it’s a big car. You’ll find three seats, three seatbelts and two headrests back there. The outboard seats are very comfortable, but the middle one is laughable. It’s a narrow pad, and there is no legroom as a massive driveshaft tunnel comes through there. Speaking of legroom, there isn’t a lot of it, but I was able to sit comfortably. Likewise, headroom is at a premium, but was fine for my height. I wouldn’t want to head out on a road trip if I was sitting in the back seat though. It also gets a bit claustrophobic back there due to the massive sweeping rear pillars that cut into your sight lines. You get two seatback storage pockets, adjustable air vents and a small storage bin with a 12V plug at the back of the center console. The middle seatback flips down to become an armrest with two cupholders and a handy, carpeted storage bin. Behind the middle seatback is a pass-through, for skis and other long, skinny items. There are two sets of LATCH anchors for kids’ seats if you need them. This is one of few vehicles where all three of our kids actually weren’t comfortable back there. The kid sitting in the middle complained about the tunnel, and not having anywhere to put their legs or feet as well as being squished width-wise. It’s perfect for two kids though. Around the cabin you’ll find a small, barely usable glove compartment (the CD player is in there), a tiny lidded storage bin at the bottom of the center stack, door bins and a nice, square, carpeted well under the armrest lid. In there, you’ll find the auxiliary and USB connections as well. The coolest surprise I found was when I touched the bottom of the center stack panel. There’s a small, metallic V at the bottom edge. All you need to do is gently pull it, and the whole control panel silently swings up and out of the way. It reveals a hidden compartment, which is rubberized, nicely lit and has a USB plug. Tap the V strip again, and it swings back into place. It’s like a little vault! I love stuff like this. So did everyone I showed it to. 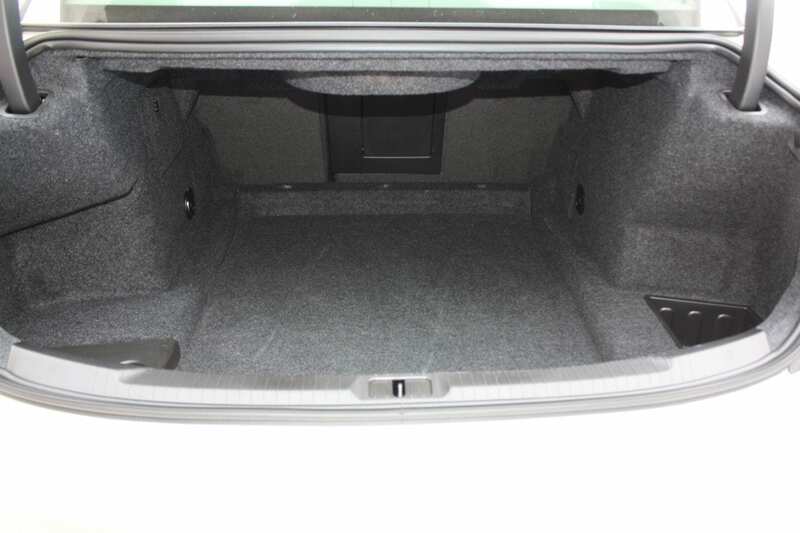 The trunk is a reasonable size at 290 Liters (10.2 cubic feet), and it is beautifully finished. Everything is carpeted and the trunk lid arms are shrouded, keeping everything clean. There’s a trunk release button inside the car, on the key FOB and on the outside of the trunk lid. I loved how low I could set the seating position, and that the seats were very customizable. I could adjust the length of the knee bolster, and the headrests adjust fore and aft very nicely. 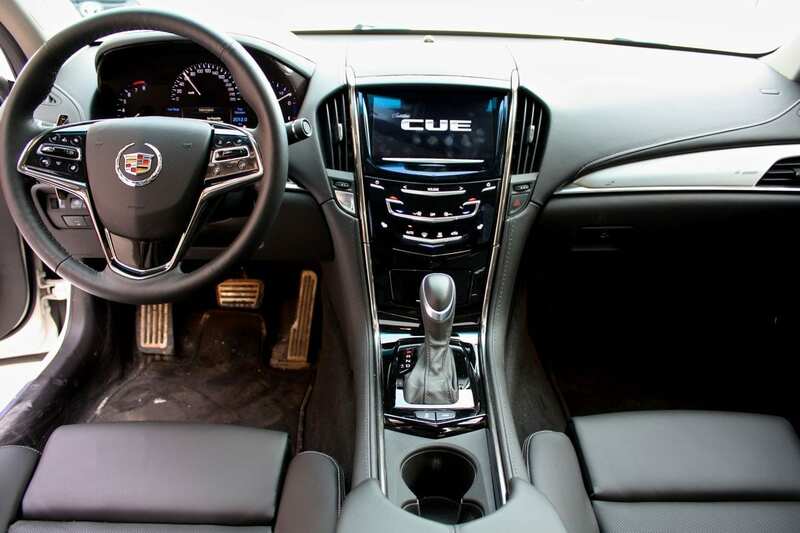 The ATS comes with a great deal pedal, and that adds to the fun. Thank you Cadillac! All in all, I will say I absolutely loved the ATS. It offers excellent in-car tech, luxury and fantastic build quality. The car is tight, poised, controlled and balanced. And it doesn’t lie when it sells itself as a sport sedan. As a matter of fact, the sport factor will be a bit more than some want, and that ride might be a bit too firm for some. 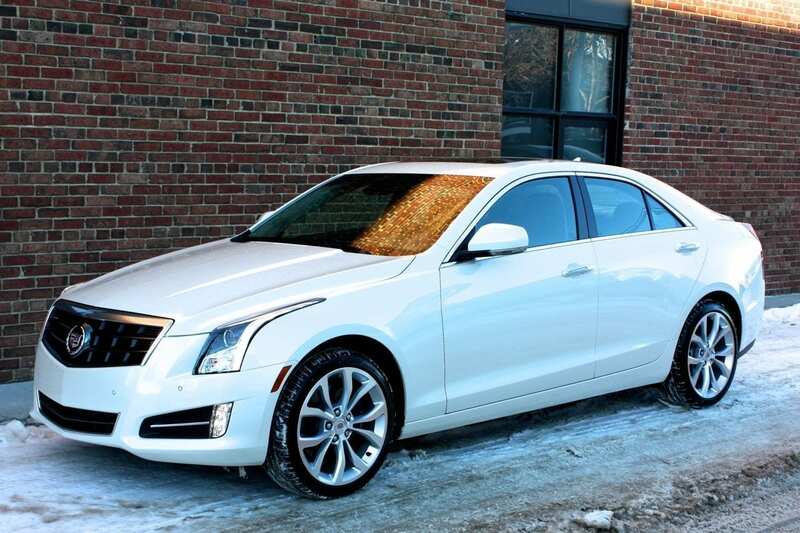 But if you’re truly shopping for an extremely competent sport sedan, regardless of what you consider the benchmark in the class, you’d be making an enormous mistake if you weren’t adding the Cadillac ATS to your shopping list. I can’t imagine anyone taking an ATS in 2.0 Liter turbo or 3.6 Liter V6 guise out for a drive and not agreeing that it is a great car to drive. WAF (Wife Acceptance Factor) was crazy high. In her words, “there isn’t anything I don’t like” – right before she pointed out something she didn’t like. She doesn’t like the low seating position. That was it. I was wondering if she’d complain about the firmness of the ride, but she never mentioned it. The ATS has brought some serious game to the table. It’s competitive, to be sure. I love that it’s available in a number of configurations, including great engine choices, manual and automatic transmissions, and rear and all-wheel drive. You can make this car into what you want. And what you need. Considering this is Cadillac’s first attempt to meet and beat the competition, I’d say the competition has something to worry about in the future. Does it beat the competition? Right now, I’d put it on par. But think about that. Putting anything on par with a multi-decade benchmark is saying something. It’s saying it’s awesome. And the ATS is. It’s awesome. I give the ATS a very solid 8 out of 10. 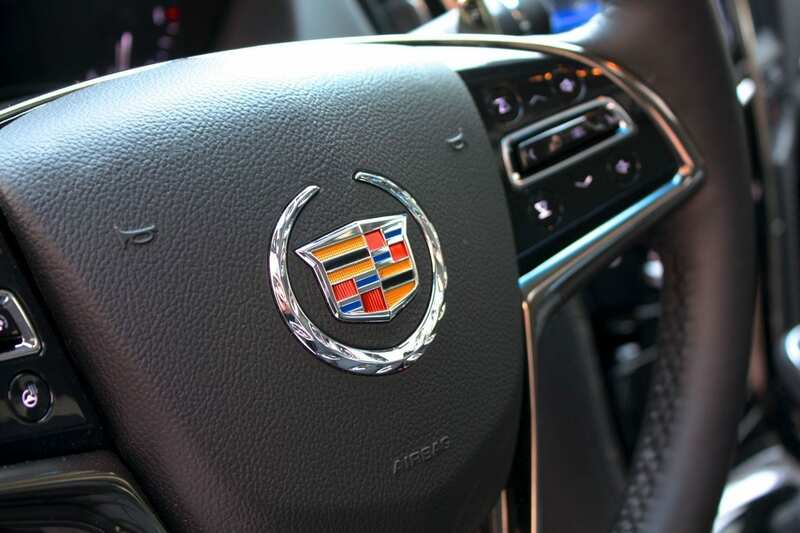 Where does the biggest challenge lie for Caddy? Well, it starts with letting people know that the ATS exists, and then convincing people to come into the showroom to check it out. Once the ATS gets considered on the same playing field as the BMW 3-series, the Audi A4 and the Mercedes-Benz C-class, and people take it for a comparative drive, it will sell itself to those looking for a true sport sedan. You bet your boots that Cadillac isn’t going to rest on these laurels. The ATS is fantastic and will only get better. Competition is great for us – the enthusiast and the shopper. Way to go, Caddy. Way to bring it!